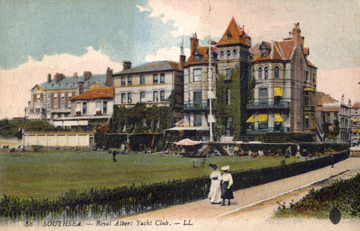 The 'Pomme' in earlier years when it was the Royal Albert Yacht Club. I took these photographs during the 1970's, the club had been closed for a few years and was due for demolition. For a while the club transferred to Palmerston Road as a basement club. 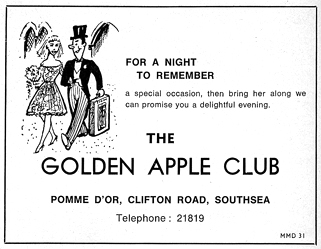 The entrance to the old Pomme D'Or club. The building had been a popular club during the 40' and 50's and had also been a maternity hospital. 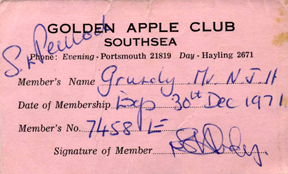 In the 1960's the club was run by Major Peacock and his wife, who lived on Hayling Island. 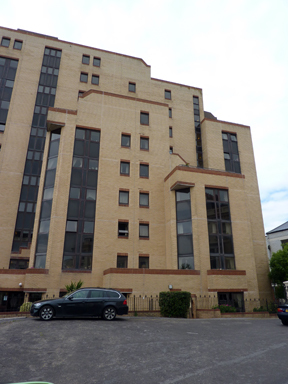 The site is now occupied by a 1970's high rise building of retirement flats called 'Home Heights.' The interesting thing is that the original top entrance step to the club survived all that demolition and re-development and forms a gateway to the flats.